The Baron spared no expense in building a grand hacienda on his plantation. This was during the time of the Spanish colonisation and the baron build this large estate to deal with cultivation of coffee plantation. Now the same hacienda invites you to discover the stunning beauty of Puerto Rico. The Hacienda Campo Rico lets you reward yourself to a perfect vacation! Make yourself at home at the “Mi Casa”. It has two levels. The ground level has a capacity to host a party or a wedding for 500 guests. It has an agro tourism garden museum and plants. It can be expanded using the adjacent bridge to the greens, where tents can be placed. The Upper level “Mi Casa” has the Blue Room which is used small weddings, cocktails, and has a seating capacity of 120people. It overlooks the wide expanse of the undulating plains. There is a meeting room and dining room for guests and a suite ideal for the bride to be. The El Mojito Bar is rustic with a remarkable appeal and has a great view of the valley. The hacienda’s agro garden has an assortment of fruits and vegetables which are harvested twice a year. Tropical flowers and herbs are also grown in the nursery. Surrounding ponds and lawns enhance the beauty of plantation. Ride beautiful Paso Fino horses to discover the marvellous Puerto Rico countryside. They provide gentle, but spirited, healthy horses that can accommodate riders from different categories. The riders are taken to the barn area for basic lessons and orientation. Once mounted on the horse, you go through table top ranges, around lakes, and through subtropical forest. Campo Rice also specialises in zip lining, canopy bridges, and 8x8 Argo vehicles, hiking, and ATV rides. You discover the way the Island’s natural wonders are conserved and marvel at the sounds and sight of the amazing wildlife. The excursions are handled by specialised tur guides and includes hotel pick up, safety equipment, and bilingual guides. Whether you are a beginner or professional golfer, you get to play golf in Hacienda Campo Rico. The academy has a state of the art teaching facility designed to improve your game. Over 300 yards of hitting area with grass tees, target greens, and a large short game area for putting, chipping, pitching, and sand play. Contact number for Administrative Office & Special Events is (787) 752-8182. Wear long pants or shorts with closed toe shoes, carry sun block and bug spray. There is a restriction to the weight limit which is 250 lbs. Adults riding with kids 2-5 years old must weigh less than 160lbs. The ride times are 9:00 am and 3:00 pm. Arrive 30 minutes before time to learn about your schedule. If you choose the ATV rides, you must be at least 16 years of age and provide a valid driver’s license. 8 years and up allowed at passenger-prices. Ride times are 9:00 am, 12:00 pm and 3:00 pm. Arrive early to learn the basic steps. Wear long pants, closed toe shoes, and bring an extra set of clothes to change into after the ride. Bring sun block, sun glasses, bug spray as well. Get your Visa or Master card. Zip lines Packages include rappelling, canopy bridges and 8x8 vehicles. They are kid friendly and provide homemade meals complete with bottled water and desserts. They provide great customer service and professional guides. Double cable and double pulley system is used. Depends on your choice of adventure. It is $55 for a two hour tour and $20 for children riding with an adult. The first class tours start at $199 per person plus tax. $75 for two hours for driver and $45 for two hours for passenger. How popular is Hacienda Campo Rico? People normally club together Luis Muñoz Marín International Airport Parking Lot and Pine Grove Beach while planning their visit to Hacienda Campo Rico. People also prefer to start their day with Hacienda Campo Rico. 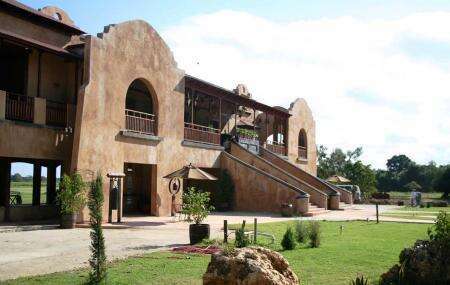 This Ranch is a very nice place to have a family out, they have rooms to stay in, zip lines and fort tracks. They have topical Puerto Rico food like mash vegetables, rice stew with pork which is very delicious and ribs. They had ran out of Sangria, but gave us instead their version of mojito which by the way was very good and very refreshing, my wife and I had three 👌🤪. The place was full, one thing you may need to wait since they had a few waiters attending the large crowd, it the food was excellent and the place was beautiful, country side the air was fresh worth the wait. In PR celebrating my daughter's sweet 16. She decided she wanted to try a couple of tours so we did the ATV and horseback riding. We have an awesome experience. The weather was perfect...hot but breezy and everyone was very accommodating. Love, love, loved Camille the guide for horseback riding. She has an excellent personality and she was very informative about not just the history of the hacienda but also Puerto Rico. The owner of the tour was super helpful, they don't open until 0830am and I took a chance and called around 7am to get more information about the tours and booking and he answered the phone and was quite pleasant. We were able to get everything arranged for the day. My daughter had a blast and to me that's all that matters but honestly, we would totally do it again next visit as well as I highly recommend checking out a couple of the tours. Both tours were very scenic and that was a plus. As a wedding photographer, hacienda weddings are my specialty. I love the natural feel and look to them, plus being outdoors makes it feel like I’m not even working. Full of beautiful patios, terraces, and tropical gardens, Hacienda Campo Rico is located in Carolina, about 15 minutes from the SJU airport and the hotel district. These are some of the reasons why I totally recommend its botanic & architectural gorgeousness as the perfect wedding venue in Puerto Rico.